Description: The intertextuality research of antique texts and their reception in Medieval and modern times is the subject of this volume: (1) What is a text and what is an intertext? This concerns the various different forms of text and how they present themselves in architecture, iconography, lexicography, the study of lists, etc. (2) Forms of intertextuality � on the relationship between writtenness and oralness, how oral texts are objectified during textualisation and become fixed acts of speech (K. Ehlich), how especially antique texts were shaped by the continual interconnectedness of oral and written traditions. (3) What is understood in ancient Oriental and antique literature by �tradition� and �transmission�? To this end, the research includes languages, historical reality and antique thought structures, making clear that the transferral of tradition occurs not only within a close cultural circle, but in the exchange with neighbouring cultures over large distances and geographic boundaries. (4) On the relationship between intertextuality and canon. A number of contributions study this aspect of ongoing historical debate as it often found for culturally definitive and canonised texts � a necessary part of the their rejuvination process. Contributions by M. Bauks, A. Lange / Z. Plese, Ph. Alexandre, S. Aufr�re, M. Oeming, K. Davidowicz, A. Wagner, G. Selz, M.F. Meyer, L. Roig Lanzillotta, M. Dimitrova, F. Waldman, W. Horowitz, M. Risch, J. van Ruiten, L. Bormann, A. Miltenova, J. Taschner, G. Brooke, G. Dorival, A. Harder and S. Alkier. 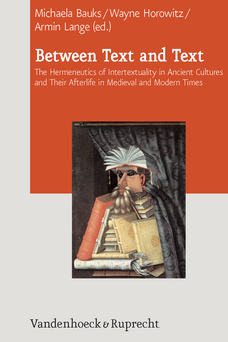 Citation: Geoffrey Miller, review of Michaela Bauks, Wayne Horowitz, and Armin Lange, eds., Between Text and Text: The Hermeneutics of Intertextuality in Ancient Cultures and Their Afterlife in Medieval and Modern Times, Review of Biblical Literature [http://www.bookreviews.org] (2014).